Protein World's controversial "beach body ready" poster is not offensive, according to the Advertising Standards Authority (ASA). 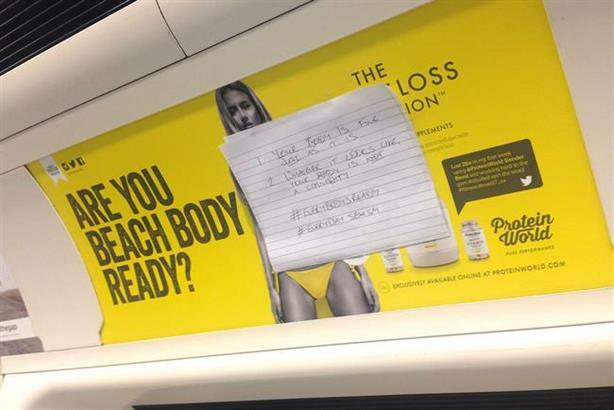 The poster, which appeared on Exterion Media sites on the London Underground, depicted a slim and toned woman in a yellow bikini next to the question "are you beach body ready?" The ad promoted Protein World's meal replacement slimming products and caused a media storm in April when it appeared. The ASA received 378 complaints about it. Most of the complaints questioned whether the ad implied a body shape different from the model was not good enough and so was offensive or if the combination of the model’s body and the headline was socially irresponsible for an ad for a slimming product. The ad watchdog banned the poster at the end of April due to concerns about the health and weight loss claims made in the ad for the slimming supplement but launched an investigation into whether it was offensive. In its ruling published today, the ASA accepted that "beach body" was a term people understood and could imply a figure similar to the model in the ad. The watchdog also considered that it could have a wider meaning of being comfortable wearing swimwear. The ASA decided that, although the text encouraged readers to think about whether they were "beach body ready", it did not imply that body shapes differing from that of the model’s were inferior. The ASA, therefore, ruled the ad was unlikely to cause serious of widespread offence and so was not in breach of rule 4.1 of the CAP Code. On the second complaint, of responsible advertising, the ASA decided that although the ad prompted people to think about their bodies, it was unlikely to shame women who looked different to the model into believing they needed to take a slimming supplement before appearing in public in swimwear. Therefore, the ASA ruled the ad was not irresponsible and did not breach rule 1.3 of the CAP Code. This article first appeared in Campaign magazine.